Lynn Lewis is conducting a Picture the Homeless Oral History project which seeks to integrate oral history and community organizing through the documentation of the history of this grass roots organization and the project design itself. Founded and led by homeless New Yorkers, Picture the Homeless has demonstrated that it isn’t sufficient to include the voices of marginalized peoples or to merely fight for a seat at the table. Being heard is not the same as being understood. Our lives are shaped by the power dynamics of interests served by existing hegemonic economic and social structures, and it is essential to understand the meaning of events, not merely what happened when, from the perspective of those harmed by structures of inequality. Our understanding of history is incomplete if we equally privilege all voices because the context of their stories is based on structural inequality. Effective resistance will originate with the stories and subjectivities of people who are directly impacted by the manifestation of structural inequality. Lynn hopes that the oral history of Picture the Homeless contributes to the practice of oral history as well as to community organizing and justice work more broadly. Lynn Lewis is the founding Executive Director and former civil rights organizer of Picture the Homeless. She was instrumental in developing Picture the Homelessness’s organizing methodology and through that process, helping to build one of the only grassroots organizations led by homeless folks in the U.S. for 17 years. None of their many organizing wins would have been possible without also shifting the dialogue within social movements to end police brutality and for housing rights in recognition that homelessness is a racial and economic justice issue and a product of social inequality. She is a founding board member of the E Harlem/El Barrio Community Land Trust as well as a board member of the Cooper Square Community Land Trust. Her work has been foundational in catalyzing the growing Community Land Trust movement in New York City as well as moving City government to invest in this model - because it is not only important to dismantle unjust systems, it is equally essential to construct alternative models. Lynn is a published author and has worked in the social justice movement for 35 years in a range of capacities in organizations and initiatives led by poor people in New York, Florida, revolutionary Nicaragua and Venezuela and is looking forward to learning how to collaboratively document the histories that poor people’s movements are creating in ways big and small through Oral History. She is bilingual in English and Spanish and is currently a consultant for social justice community organizing groups in NYC, and is a former Revson Fellow at Columbia University. Carlin Zia has, over the past year and a half, been conducting a self-reflexive oral history project recording her paternal grandfather’s life story and considering her own relation to that story through themes of language, race, belonging, and family. 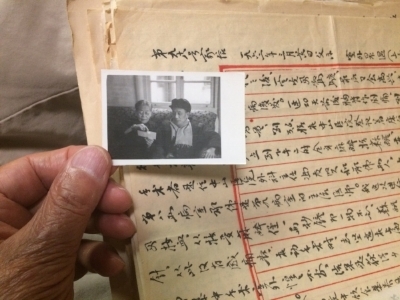 An essential source for her research is the collection of 143 letters that her great-grandfather in China sent to her grandfather in the States between 1949 when he left home and 1966 when the Cultural Revolution began and it became too risky for her great-grandparents to have any communication with someone in the United States. Over the Thanksgiving holiday Carlin was able to scan all 377 pages of her great-grandfather’s neat brush script. Now with the help of the OHMA/GSAS Student Research Grant, she will be able to commence translation from Chinese to English and access this invaluable material. Carlin comes to OHMA from an English literature background. She brings with her a love of language and narrative and writing, and is excited to get up to speed on social science theory and audio/visual mediums. For the last year she has been working on a project with her Chinese-born grandfather to record his life story, and in so doing to engage more deliberately with her own Asian\American identity. After a couple months she learned that what she was doing was a real thing and it was called Oral History. The rest is ongoing. Follow the link to view more current student bios and check out the work of our former research award recipients here.